It’s hard to imagine dozens of hot-air balloons taking off each year from the grounds of Westminster or Capitol Hill, floating above the hallowed halls of the nation’s political power. But, while Australia’s politics is a hybrid of both the UK and US political systems, Canberra is definitely not a hybrid of Washington and London. Instead, the nation’s capital is its own distinct place, one that is accessible, fun, and definitely open to playing with balloons. 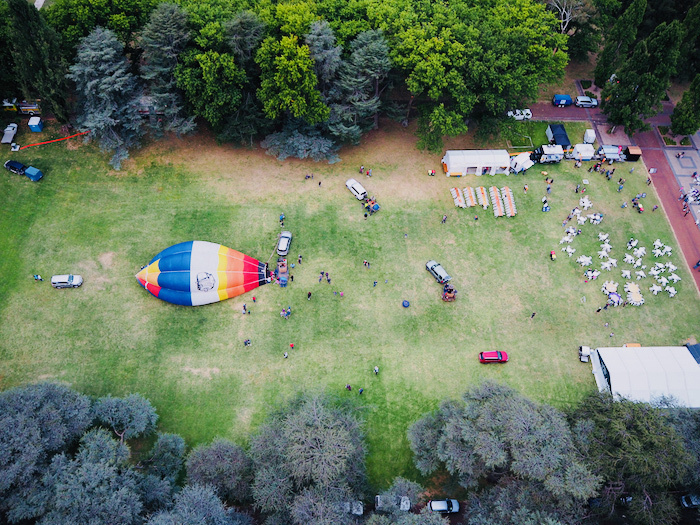 The Canberra Balloon Spectacular is the annual event that brings together over two-dozen balloonists from around the world, departing over nine days each March from the lawns of Old Parliament House. Visitors and locals are invited to hop in the basket for incredible views, and tick off a bucket list experience soaring in the skies. Which is exactly what I intended to, showing up for a 6:15am flight as the sun approached the horizon. Ballooning already features on The Great Australian Bucket List, with a chapter about ballooning over the Murray River in the Barossa region of South Australia. For those who have never hopped in a basket, it’s a far gentler adventure than one would expect. Ballooning gives one the sensation of quietly floating, free from the noise of engines or the speed of other forms of flight. Hovering over lakes and rivers, you won’t so much ripple the water below. Pilots are at the mercy of wind and thermal currents, able to navigate altitude if not direction. This is why conditions are so crucial for a successful flight, and why early mornings are favoured before the heat of the sun plays havoc with air currents. Seeing the sunrise in a wicker basket hundreds of metres in the sky is also instantly memorable. Unfortunately, it wasn’t a perfectly blue-sky morning when I met my fellow flyers and pilot in the lobby of the Questacon Science Museum at 5:45am. In fact, it was misty and overcast. Still, the winds were calm enough for a greenlight, which is more than I can say for my half dozen other attempts at ballooning around the world. Pilots release a helium balloon and carefully monitor what it does as it rises into the atmosphere, a low-tech but effective means of reading the conditions. My flight is with Balloon Aloft, and we drive to a field to unpack the balloon and basket and get ready for the flight. Passengers assist by holding the balloon envelope while the pilot blasts heated air inside. These gas-powered blasts sound like mini-jet engines, powerful enough to fill the envelope in about 15 minutes. The gas blasts keep the balloon flying, and warm passengers in the basket. There’s a lot of anticipation as the envelopes fill up, pulling the 8-person basket upright. Once critical mass is achieved, there’s little time to dawdle. We scamper into the partitioned sections of the basket, and away we go. The early morning chill dissipates with each blast from the burners, as slowly we rise to see a stunning view over the capital and surrounding valleys. Surrounded by other balloons gives me a sense of scale and distance, the colours of the envelopes brightening up the skies for balloonists, as well as onlookers and early morning commuters below. The distinct road ring that surrounds Parliament Hill showcases the careful planning that went into the capital, while Parliament Hill itself looks somewhat bunkerish and fortified from above. We drift with the current towards the artificial Lake Burley Griffin that flows in the centre of the city (named after the American architect who won the award to design Canberra). After a 45 minute flight, the pilot signals the perfect spot to land adjacent to the National Rock Garden. We’re instructed to brace for the landing, which can be smooth or bouncy, depending on conditions, and the skills of the pilot. This morning, our Balloon Aloft pilot is on form. He keeps the balloon upright long enough for support teams on the ground to hold it down long enough for us to climb out, and the balloon quickly deflates. We all assist in the folding of the envelope, and are shuttled back to the lawns of Old Parliament Hill for a buffet champagne breakfast awaits. By mid-morning, the balloons have landed, the pilots and passengers are trading stories, and a few more bucket lists have been ticked. The Canberra Balloon Spectacular is part of the city’s annual Enlighten Festival. 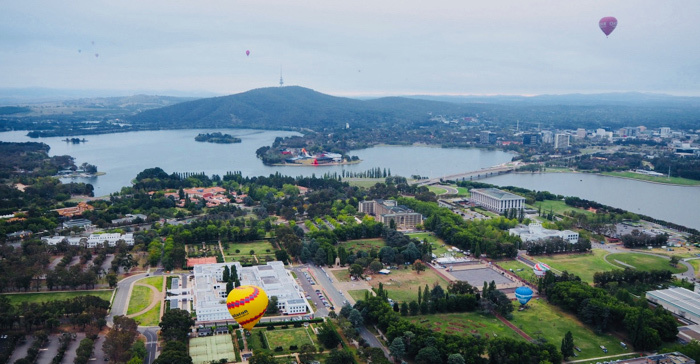 You can also book your scenic flight and find out more info with Balloon Aloft Canberra.